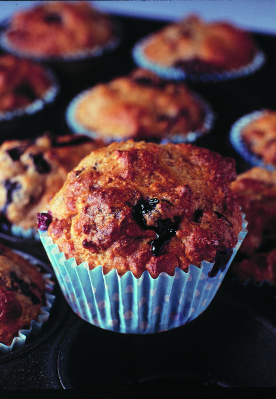 These muffins are very easy and quick to make and are low in fat and sugar compared to most muffins. Grated apple is added to give the mixture a light, natural sweetness and a moist texture, so there’s no need to add butter or a rich topping. * 1: Preheat the oven to 180°C/350°F/Gas 4. * 2: Sift the flour, salt, baking powder and bicarbonate of soda into a mixing bowl, then tip the bran remaining in the sieve into the bowl. Stir in the sugar. * 3: Quarter the apple, remove the core then grate the apple straight into the bowl without peeling. Stir in so the apple is thoroughly combined with the flour and is not in clumps. * 4: Beat the egg into the measured yogurt until thoroughly combined, then stir into the flour mixture. Finally mix in the blueberries. * 5: Divide the mixture evenly between the paper muffin cases then bake in the heated oven for 25 to 30 minutes or until a good golden brown and firm to the touch. Cool on a wire rack. Best eaten within 24 hours.